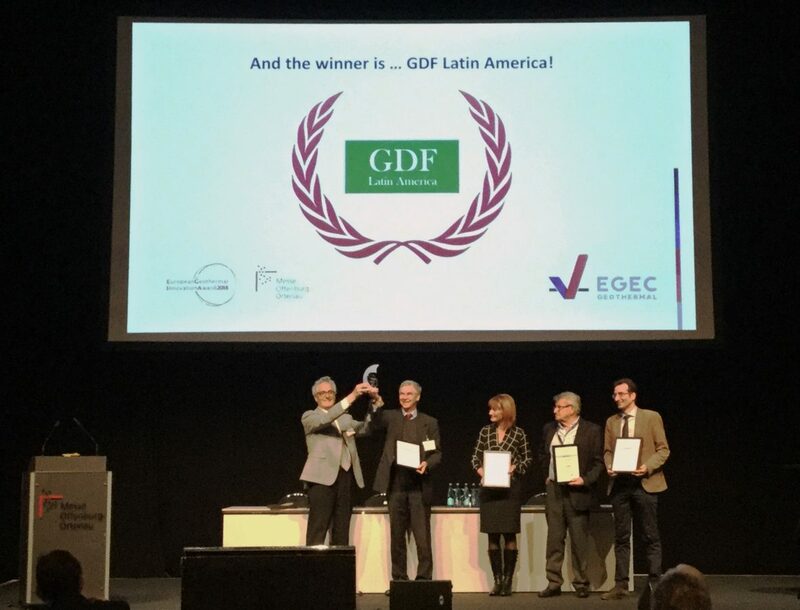 During the opening ceremony of the GeoTHERM Exhibition and Congress 2018, the European Geothermal Innovation Award 2018 was awarded to the Geothermal Development Facility (GDF) Latin America, the first multi-donor climate initiative offering risk mitigation for surface studies and appraisal drillings during the exploration phase of geothermal projects in Latin America. GDF is an innovative financial mechanism that fosters geothermal development in Latin America, both in South America and Central America. It has been operational for two years and is mainly funded by the European Union and Germany. GDF Latin American won against a strong competition from the four other endorsed nominees: GPC Instrumentation Process (France), for the design and implementation of the first sub-horizontal well in a geothermal project, a technique so far only used for oil drilling that allows to drain more hot water over a long length; Politecnico di Torino (Italy), for their system ENERTUN, that allows transforming a tunnel lining into a low enthalpy geothermal system; PORCIÓ Ltd. (Hungary), for the Gyopáros Production and Reinjection Geothermal System, in operation at Gyopáros Thermal SPA; RWTH Aachen University (Germany), for the development of their Temperature Sensor Module (TSM) for detecting groundwater flow velocity and direction near a borehole heat exchanger. A total of 19 nominations were received from around Europe. These included submissions from a wide range of companies and research institutes, demonstrating the enthusiasm of the sector and the constant efforts towards innovation, increased efficiency, and reduction of costs. The jury for 2018 was composed of Christian Boissavy (France), Adele Manzella (Italy), Sandra Kircher (Messe Offenburg, Germany), Bruno Leray (France), and Javier Urchueguia (Spain). The European Geothermal Innovation Award is an initiative from EGEC, the European Geothermal Energy Council, in collaboration with Messe Offenburg, organisers of the GeoTHERM fair and congress. The award is given to entities that have made an outstanding contribution towards the field of geothermal energy in the form of innovative products, scientific research or project initiatives.